It is important to test out cupcakes at home because you never know what you might just find around the corner. During the week leading up to my AP Exams, my Mom decided to treat me by stopping at a bakery that she heard of and bringing a few cupcakes home. I tried local cupcakes from a small, new shop, near my home called The Sweet Lush Cupcakery. 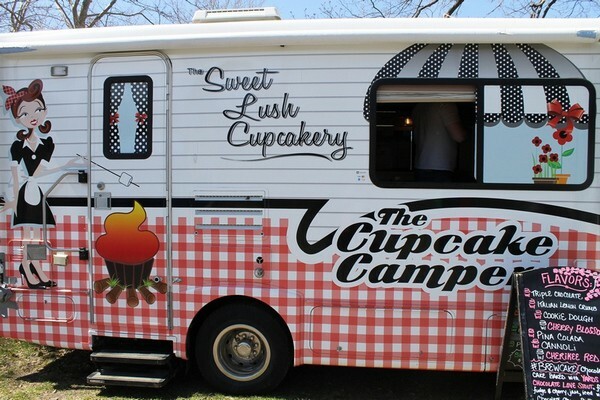 Their bakeshop is located in Dunmore, Pennsylvania and they also run a Sweet Lush Cupcakery Camper. The ‘food truck’ type cupcakery appears at local festivals and events. At our recent Cherry Blossom Festival, they were selling very well! They have been extremely successful. While the cupcakes are slightly overpriced for a local cupcakery in a small city at three dollars each, they were tasty and large. The icing was sweet and managed to not go over the top. I particularly enjoyed the Cannoli cupcake and Cookie Dough cupcake. Watch out for the insane amount of icing on the cupcake that is beautifully decorated! The cake could have been a bit more moist but there was a clear balance between the cake and icing which is even more important. My problem was the price of the cupcake. While it was good, it wasn’t fantastic. I don’t like paying more than three dollars per cupcake when they weren’t unbelievable. Since the beginning of seventh grade, I was an active member of my high school’s speech and debate team. In June of 2014, I was lucky enough to qualify to the National Tournament of the National Forensic League in United States Extemporaneous Speaking. Last year, the national tournament was held in Overland Park, Kansas, which is extremely close to Kansas City. The food in that area was unbelievable. That feeling left me with high expectations for the cupcakes that I was destined to find. 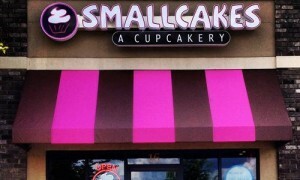 I was excited that since I was traveling to a new place, I could find a new cupcakery in the Mid-West to try! I knew that Smallcakes was the favorite bake shop, in close proximity to our hotel. But, due to how busy my schedule was for competition, my coaches actually went to the bakery, picked out the cupcakes and purchased them. I didn’t even pick what I wanted, but I heard that there wasn’t a large selection. Since I didn’t visit, I can’t tell you about the feel of the cupcakery or its atmosphere. I am sorry! But, I can tell you the most important fact…I have definitely had better. Of the dozen that they brought back, I think my favorite cupcake of the few that I ate was called Caramel Crunch. It was chocolate cake with caramel frosting topped with sea salt and pretzels. I do love sea salt on everything. Also, the name doesn’t lie…they are definitely small cakes. Of course, I had to try their “Famous” Red Velvet which is the baker’s grandma’s red velvet cake with her signature cream cheese frosting. The frosting was very good but the cake wasn’t perfect. The appearance of the cupcakes was adorable with the Hot Fudge Sundae looking quite realistic! The food in Kansas City was worth the trip. Life is short…eat a cupcake!